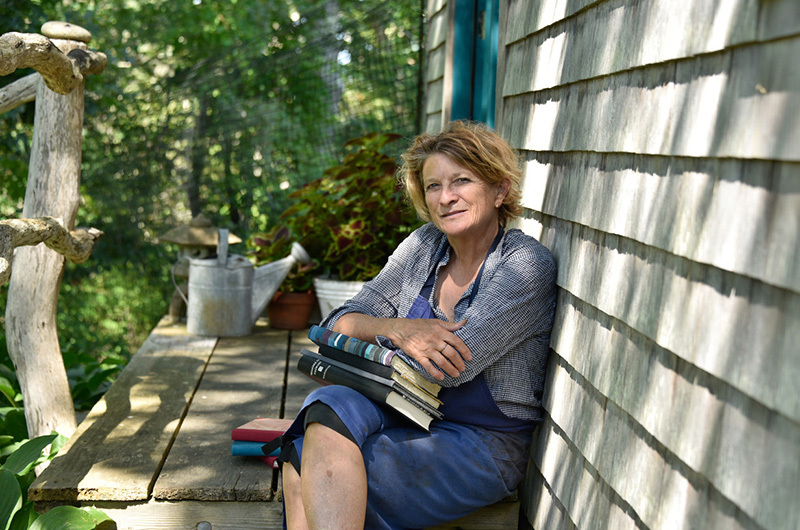 Mitzi Pratt, outside her Aquinnah studio, has worked as a bookbinder since the 1970s. Ms. Pratt has worked as a bookbinder since the 1970s and began with an apprenticeship in Northampton under bookbinder David Bourbeau. 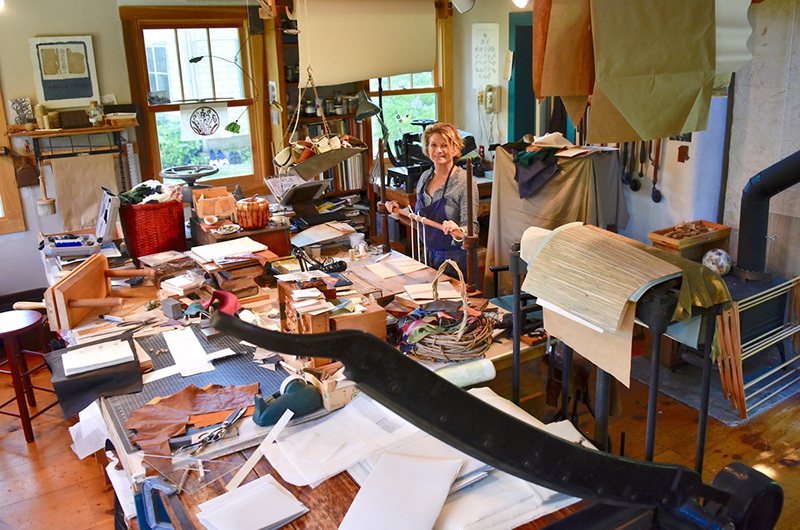 For decades she has run her own bookbinding and book restoration business, M.E. 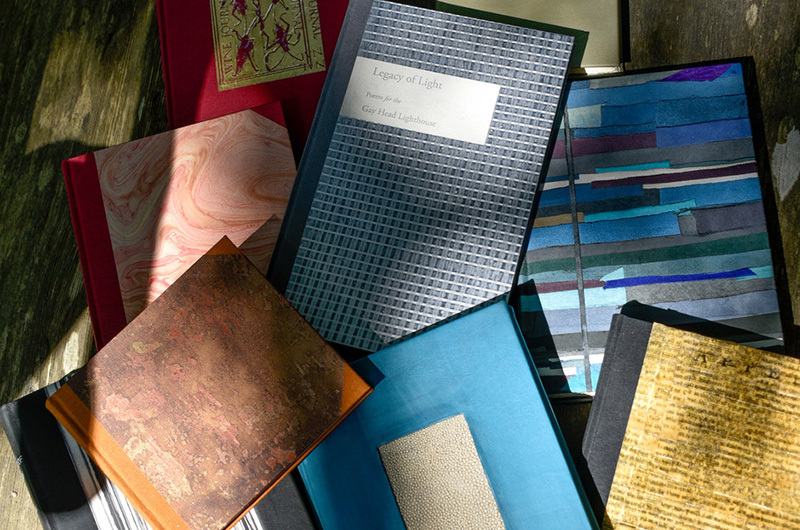 Pratt Bookbinder, with studios in Aquinnah and Brooklyn, N.Y. While the books, journals and sketchpads Ms. Pratt creates vary in their final forms, they begin, homogeneously, as a stack of paper. “I use ingres paper,” Ms. Pratt says, slicing through a thin sheet with her board sheer, its razor gliding through the cream-colored surface with ease. She then folds the freshly cut sheets into “signatures” which are later stitched together as the pages of a book, journal or photo album. She uses a bone folder, a plastic tool no bigger than the length of her hand, to crease the sheets. From the press, the signatures travel across the studio space to a sewing frame. 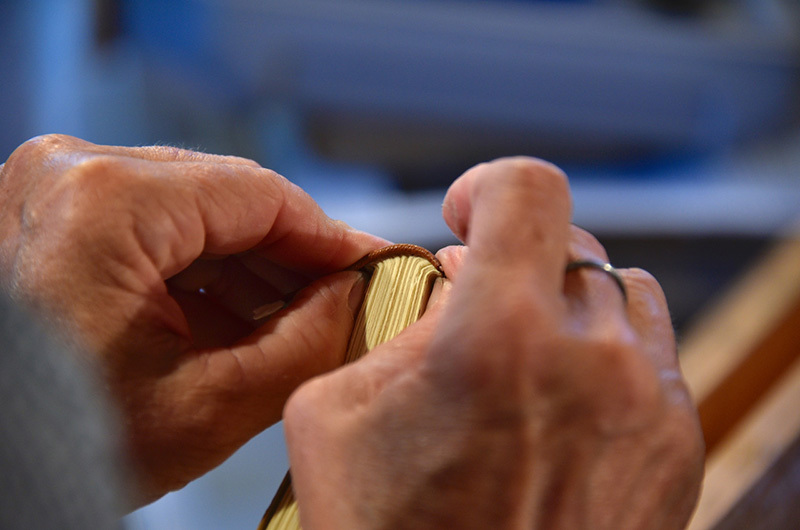 She uses a book binder’s needle to guide a string of gray linen thread through the neat stacks. “The eye of the needle is quite small, and it’s a little longer and thicker,” she explains. The thickness of the needle helps to push and pull the thread through the paper, a meticulous process that ultimately creates the book’s spine. Once sewn, Ms. Pratt coats the spine in a layer of polyvinyl acetate (PVA) glue to reinforce it. The glue is water-based, flexible, and only takes a few minutes to dry. Once the glue dries, the rounding process begins. She carries the bound pages, which at this stage closely resemble a completed book, to her backing press. At a work table next to the press, she attaches a flyleaf, or end sheet, before using a hammer to round the spine. From there she carefully pounds the length of the stitched end, flipping it over and repeating. This process not only creates the shoulder that the book will fit in, it also provides some daily exercise. “This all keeps my right arm strong,” Ms. Pratt says, her arm rising and falling with the bang of the hammer. She quickly places the stack into her backing press, spine side up, to be whacked again, thus finalizing the grooves for the boards of the cover to lie into. The assemblage of the covers is where Ms. Pratt’s artistic talent shines. She has fashioned covers out of countless materials, ranging from leather to suede to even a wasp nest. “I peeled off pieces of the nest and laminated it onto a piece of paper to make the cover,” she says of that creation. When asked how the idea came to her, she shrugs. “How does one get any idea?” she counters. Ms. Pratt also embosses different objects like glass eyes or stones from Philbin Beach into the leather covers. “I tend to do a lot of wordplay with the names I give the books,” she says. A piece of black suede lay across her worktable next to a pile of miniature dice. Mitzi Pratt will host an open studio on August 11 from noon to 6 p.m. at 5 Moshup Trail in Aquinnah. For more information, visit meprattbookbinder.com. More photos from Ms. Pratt's studio. This is wonderful! Bravo Mitzi!! !